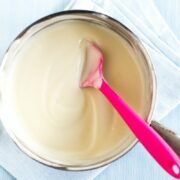 My straightforward method for how to make a simple white sauce (béchamel sauce) - one of the first things any beginner cook should learn! 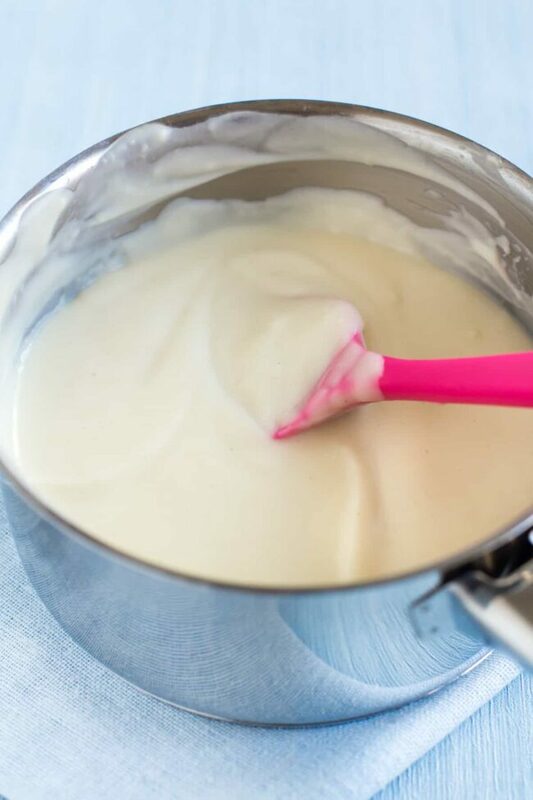 Here’s my straightforward method for how to make a simple white sauce (béchamel sauce) – one of the first things any beginner cook should learn! 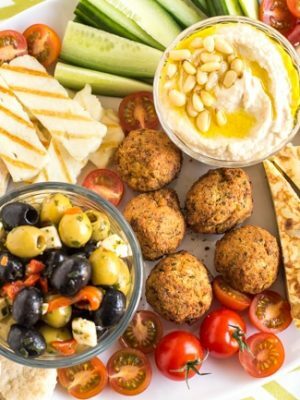 Easy Cheesy Vegetarian is a site for expert cooks and beginners alike, so I do like to share some more basic recipes every now and then. 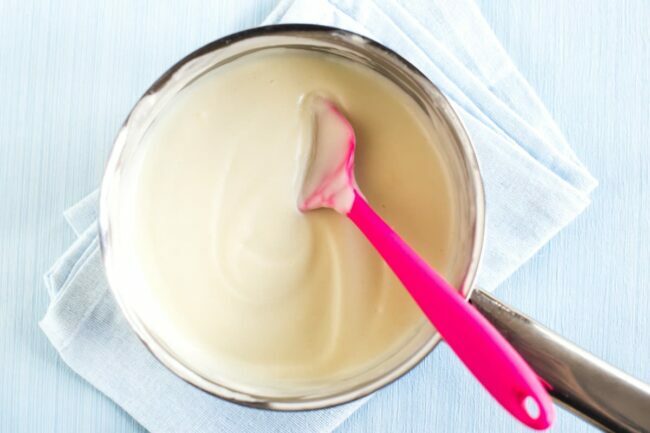 And you can’t get much more basic than a simple white sauce (béchamel sauce) – the basis of so many amazing recipes. 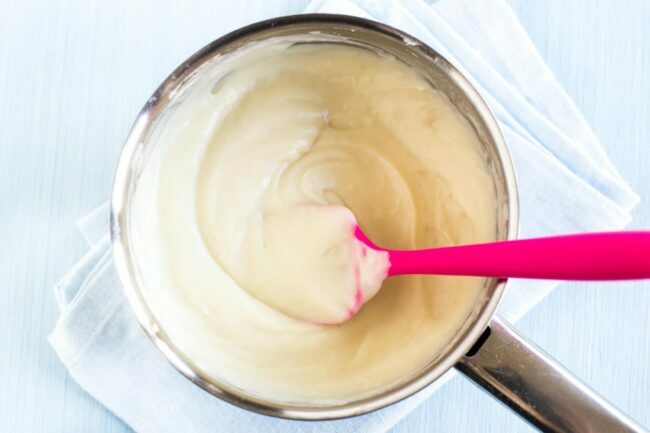 I asked in my Facebook group recently what sorts of ‘kitchen basics’ guides people would like to see, and lots of people said they had trouble making a good white sauce – so here’s how! 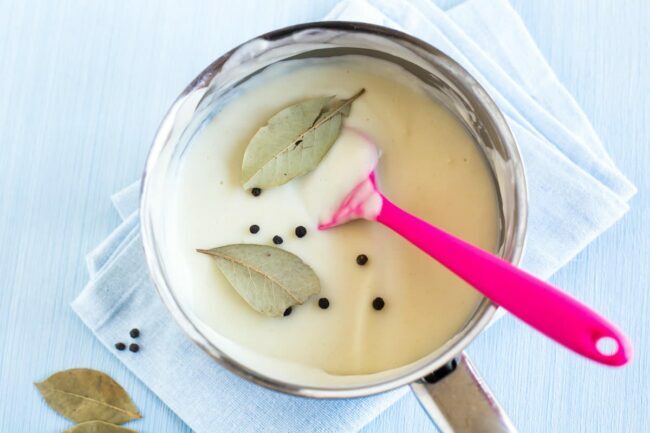 Here are my top tips for making a perfect white sauce. Once you get the hang of it, it’s incredibly simple, and it’s a skill you’ll use again and again. A white sauce is the same as a béchamel sauce, so you might see those two terms used interchangeably. I’ve obviously broken the process down into tiny little steps for the purposes of this blog post, but in reality it only takes about 10 minutes max. Start by melting some butter (I use unsalted) in a small saucepan, and add some plain flour. 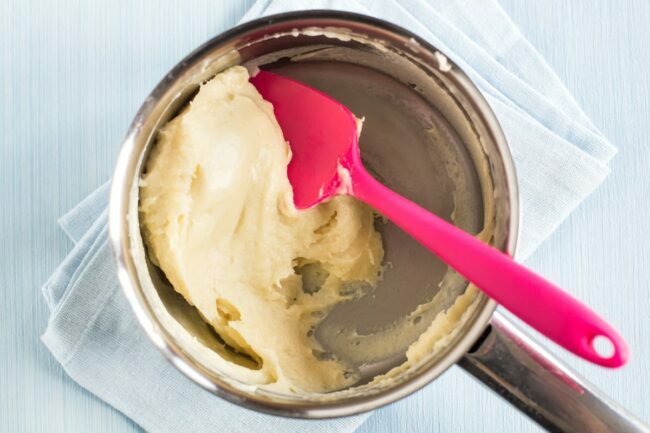 A good rule of thumb is to use approximately the same volume of butter and flour – so if you use two tablespoons of butter, you’ll want to use about two tablespoons of flour as well. 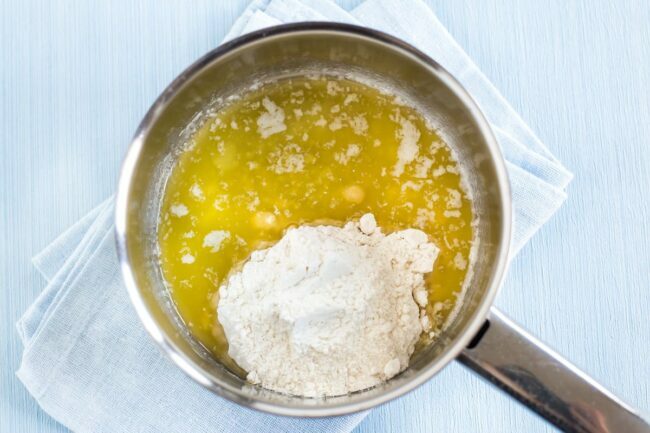 With the pan over a low heat, mix the flour into the butter. 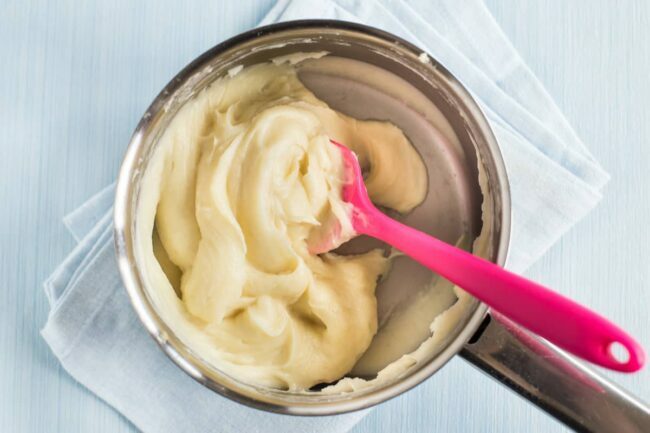 This gives you a roux – which is just a fancy name for this paste. 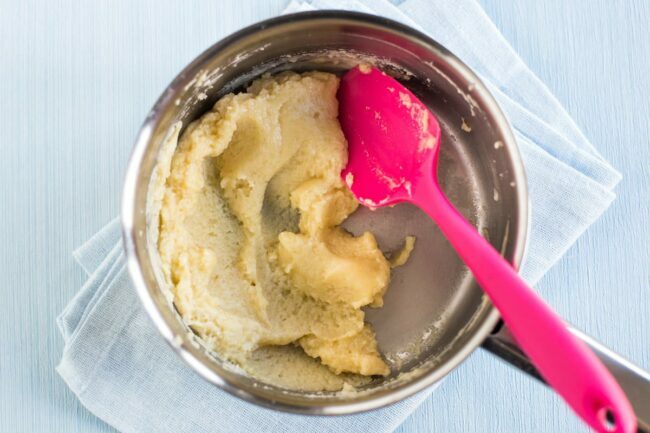 Cook the roux over a low heat for a minute or so, just to get rid of that ‘raw’ flour taste. If it sticks or starts to burn, you need to turn the heat down. 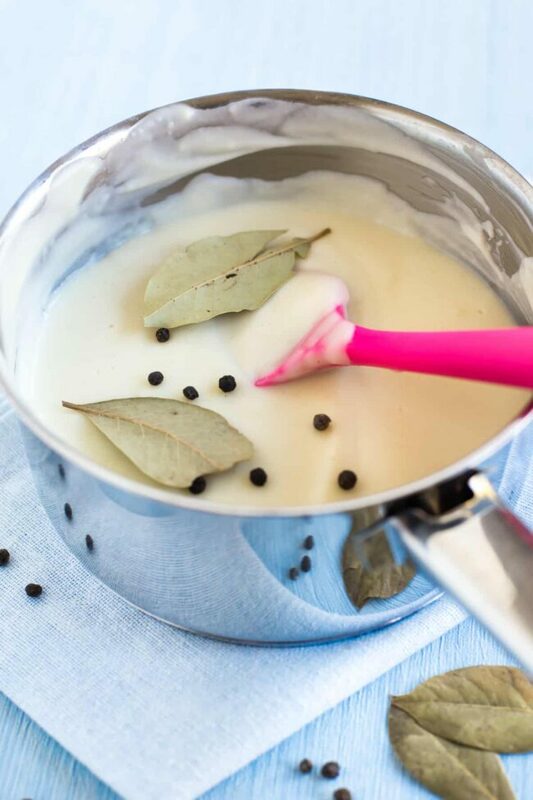 What kitchen tool is best for making a white sauce? I always use these silicone spatulas when I’m cooking (you’ll see them appearing again and again and again in my photos, being their obnoxious bright pink selves), but they’re especially brilliant for making a white sauce. 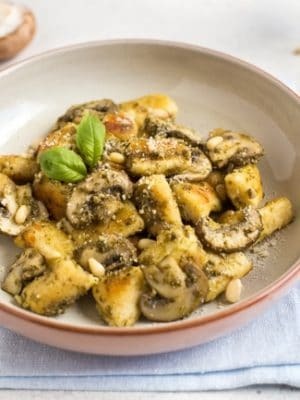 I never use anything else now – they’ve got slightly square corners, which are great for getting right into the corners of the saucepan to scoop up any lingering flour, and they’re ever so slightly flexible, so it’s really easy to use the back of the spatula to press out any small lumps from the sauce. I also find them a lot nicer to use than wooden spoons – they don’t hold onto flavours and smells from your cooking, so you can make a curry one day, and custard the next, without ending up with curry-flavoured custard. If you haven’t got anything similar, you can get a set on Amazon UK* or Amazon US*. Otherwise, you can try using a small whisk, if you have one. 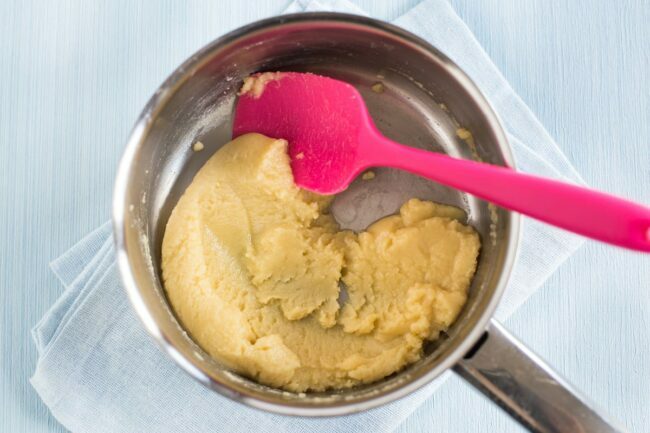 A regular spoon will work okay too, but you’ll need to scrape out the bowl of the spoon every now and then to make sure no flour or butter is getting left behind. Next, it’s time to start adding your milk. To begin with, you’ll need to add the milk a little at a time – just a few tablespoons at first. Keep the pan over a medium-low heat (on my hob, I use setting 3 or 4 out of 9), and stir constantly, using the spoon to smush the roux down into the milk (not a technical term, but perhaps it should be) and get it all mixed in nicely. After a minute or two of stirring and smushing, the milk will be fully incorporated into the roux – at this point, the paste will still be pretty thick. When everything has come together like this, into one well-combined mixture, you can add a dash more milk. Each time you add more milk, you’ll need to stir until smooth again. If you feel like your sauce is lumpy (like in the photo above), it’s probably just because it’s not ready yet. Don’t be tempted to stop at this point! It still needs a lot more milk yet. Just keep stirring over a low heat until everything comes together – the lumpy sauce you see above turned back into a thick paste when I gave it another minute on the heat! Continue adding a dash of milk at a time, stirring until the mixture is smooth each time before adding more. At this point you can start to add the milk a bit more quickly – there’s no harm in adding a good slosh of milk each time at this point. 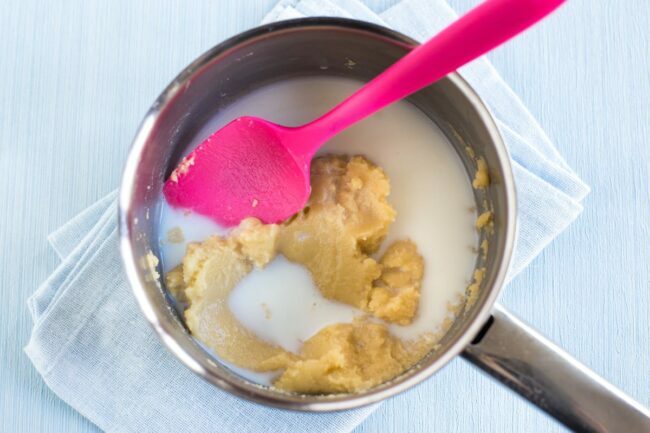 Each time you add more milk, the paste you create will be a little thinner. It will also become less yellow each time (we’re making a white sauce, after all). Just keep going until the sauce reaches your desired consistency. My white sauce is nearly there! As long as it comes together into a sauce-like consistency over the heat, and doesn’t thicken up into a paste like you were getting before, it’s ready to use. 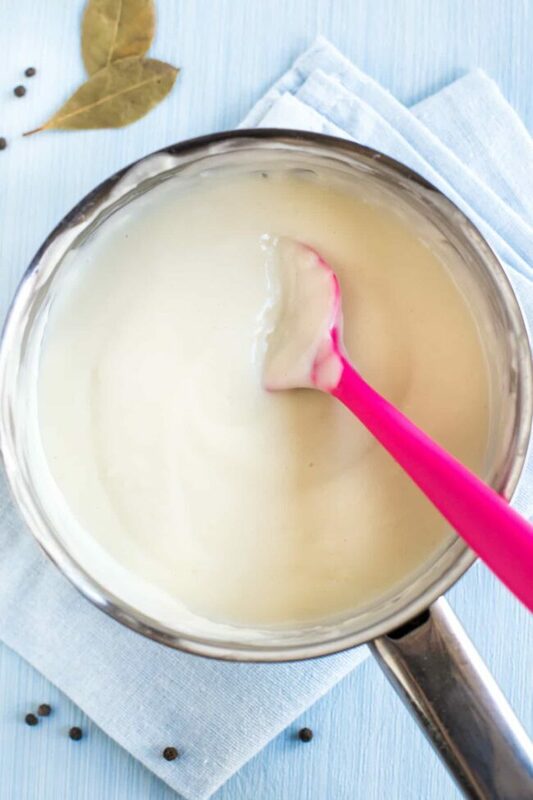 Depending on what you’re using your white sauce for, you can stop when the sauce is thick, or add a bit more milk for a thinner white sauce. Remember that if you’ll be baking the sauce in any kind of casserole (like macaroni cheese! ), it will thicken up more in the oven, so it’s better to start with a thinner sauce. Step 4: Add some flavour! A white sauce that’s literally just made with butter, flour and milk won’t have a huge amount of flavour. At the very least, you’ll need to add a big pinch of salt and pepper. This time, I added a couple of whole bay leaves and some black peppercorns. Other great options are a whole nutmeg, some chunks of onion, or a couple of whole garlic cloves. If you’re simmering these in your sauce for a little while, you’ll need to start with a sauce that’s slightly thinner than you want it to end up, as it will thicken up a little more as it cooks. If you don’t want to have to deal with fishing whole herbs and spices from your sauce, just use pre-ground ingredients instead – a pinch of ground nutmeg is great, along with some onion powder and garlic powder if you fancy it. Easy, right? Just stir some grated cheese into the completed white sauce until it melts right down. Adding cheese tends to thicken the sauce a little, so again, you’ll need to start with a white sauce that’s ever so slightly thinner than you want it. 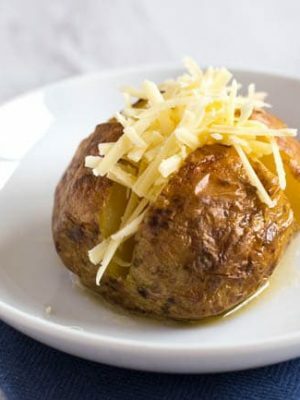 I like to use a couple of different cheeses to make my cheese sauces – usually some grated mature cheddar for flavour, and some grated mozzarella for that luxurious stretchiness. The quantities aren’t important – just add however much you feel you need to get the sauce of your dreams. Not going to lie, in my house this is usually quite a lot. What can I use a white sauce for? …or top with a simple scone mixture for a vegetable cobbler! What will you make with your simple white sauce? 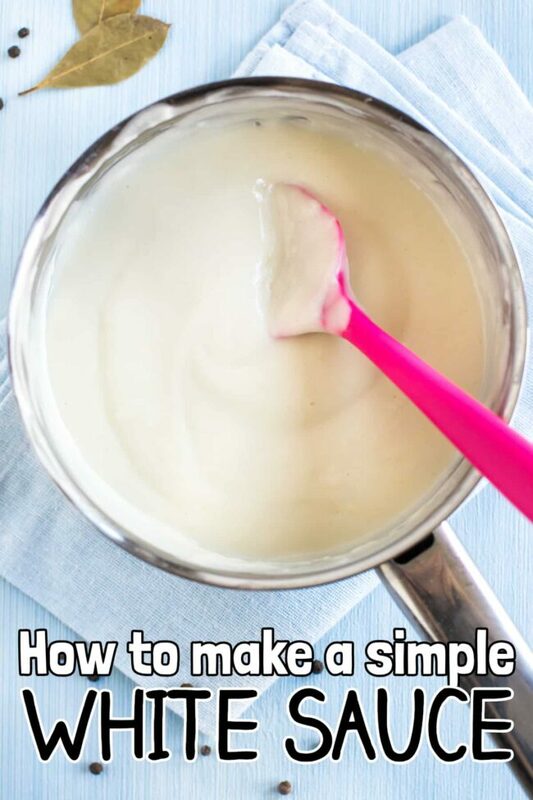 My straightforward method for how to make a simple white sauce (béchamel sauce) – one of the first things any beginner cook should learn! Over a fairly low heat, melt the butter in a small saucepan, and add the flour. Mix well to combine, and cook for a minute or so, stirring constantly. Add a dash of milk, and mix until completely combined. Continue to add the milk a little at a time, over the low heat, mixing until smooth each time before adding more. 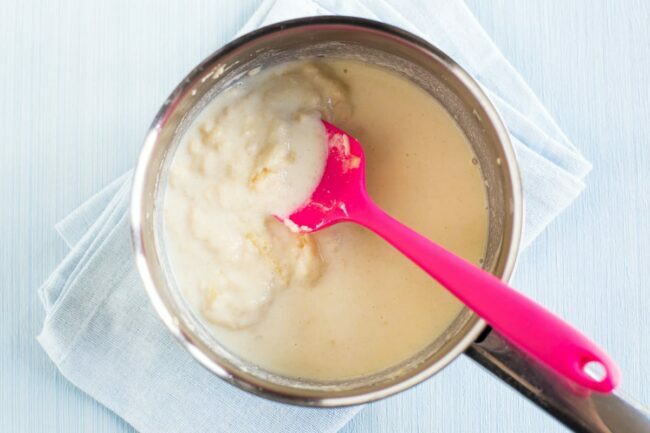 You’ll need at least 250ml (1 cup) milk for a very thick white sauce – add more for a thinner sauce. See the full blog post for more detailed instructions, including how to infuse the sauce with other flavours. Love to cook your sauces from scratch? 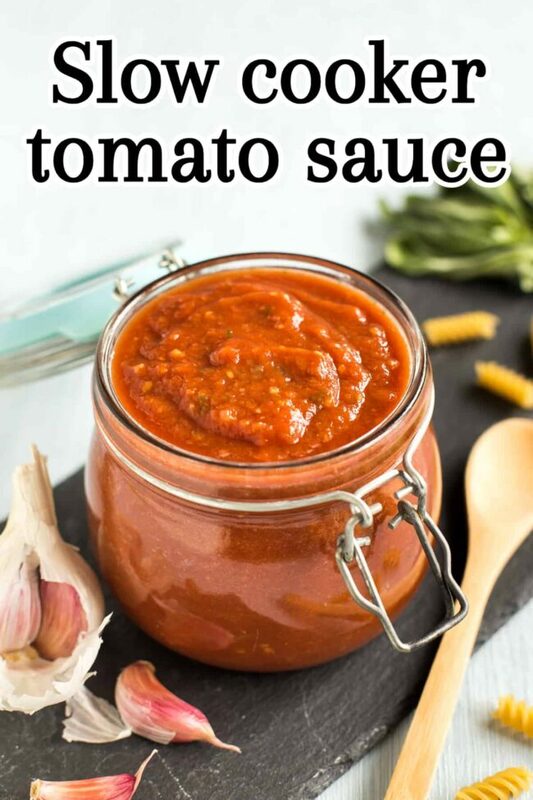 This slow cooker tomato sauce is a great one too – why not make both, and create an amazing lasagne! I’m less patient, I suppose, at least since cooking for kids. These days I’ll make my roux, then when its cooking (I always use a whisk FWIW) I’ll toss my milk (in my Pyrex measuring jug) into the microwave for a minute or two, hot but not boiling, then just dump it in. One quick whisk later and it’ll start to thicken up almost immediately with no lumps or issues. I’m sure it could be better, but doing it that way takes very little time and results in a perfectly acceptable béchamel, so….? I have never tried such sauce and It was very delicious.